It’s an aspect of dog training that you will be teaching him many verbal commands. Sit, stay, heel and come will be staples of your routine. Your dog is responding to more than just the words you use; he’s interpreting your tone of voice, your body language, and your facial expressions to determine the nature of your commands. In this vein, language is so much more than verbal. Your dog has his own ways of communicating with you that you can interpret if you know what to look for. A dog communicates primarily with body language and secondarily with verbal cues. When you observe your dog, make sure that you observe his entire body. Don’t just pay attention to the tail or the ears. He may be wagging his tail but the rest of this body may be saying something entirely different. When it comes to communication, different cues can be grouped into five categories: fear, aggression, anxiety, arousal, and relaxation. Fear: A frightened dog may cower or whimper. He may lower his body, tuck his tail, and retreat. Other signs are trembling, shaking, licking his lips or yawning, putting his ears back, and leaning back. 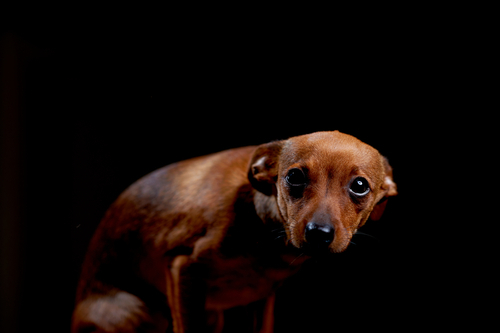 A dog that acts differently from normal may be exhibiting fearful behavior. If he’s avoiding people, staying hidden, and not eating, these could also be behavioral signs of fear. Aggression: Knowing what to look for in an aggressive dog can be the difference between defusing a situation and escalating one. Dogs often display aggression when they are guarding their territory. Growling or barking are obvious verbal cues, but look for other body language before these occur. A dog may stiffen first to show aggression. He may put his ears back or widen his eyes. Heed these actions before the dog starts nipping at the air to de-escalate the situation. Anxiety: The signs of an anxious or stressed out dog will be in some ways very similar to a fearful dog. He may display pacing and panting, licking his lips and yawning. If a dog is continually anxious, his health may suffer and he may shed excessively and drool. If your dog is in a kennel and is uncomfortable with his surroundings, you will be able to see his anxiety in his behavior. Excitement/Arousal: A dog’s excitement behavior is generally standing erect with ears forward and tail wagging quickly and stiffly. He may bite, bark, or lunge forward. He may jump, run in circles or back and forth. He may pant excitedly, or alternate moving his legs in place as if he wants to run and doesn’t know where to go. Relaxation: A relaxed dog is perhaps the easiest dog to identify. His legs may sprawl out lazily when lying down instead of tucking under his body. His mouth will hang open with his tongue drooping out. His head and ears will be central and he will make happy grunts. His tail will slowly wag back and forth and his muscles will be loose. A relaxed pup is a happy pup. Learning the verbal and non-verbal cues of your dog is an essential part of dog training. At All Dogs Unleashed, we will train you in identifying these behaviors so you can understand your dog throughout the teaching process. The better communication you have with your best friend, the better your relationship will be throughout his lifespan. Puppy Training in Dallas: When Can my Puppy Start Obedience School?